The star has followed in the footsteps of his cycling legend father. Nicolas Roche has secured the overall win at the Route du Sud (file pic). IRELAND’S NICOLAS ROCHE followed in the footsteps of his cycling legend father Stephen Roche by winning the Route du Sud cycling race after the third and final stage on Sunday. Roche’s father Stephen won the race through southern France in 1985 before going on to win the triple crown of the Tour de France, Giro d’Italia and world road race championship two years later. It is the first victory for the 29-year-old Tinkoff-Saxo rider in a stage race after he took the lead by winning Saturday’s second stage. Italy’s Adriano Malori of the Movistar team won Sunday’s third stage finishing ten seconds ahead of the peloton after the 179.4km run between Saint-Gaudens and Castres. Malori resisted the peloton lead by France’s Benjamin Giraud and compatriot Maxime Daniel in the race for the line. Email “Ireland's Nicolas Roche wins Route du Sud title”. 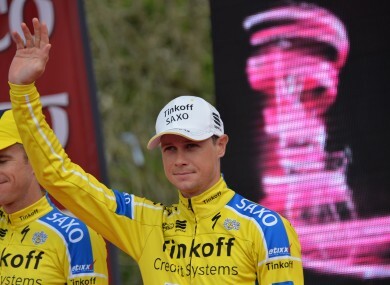 Feedback on “Ireland's Nicolas Roche wins Route du Sud title”.